Adjust all dates to your weather. Click here to do this, it takes less than a minute and your settings will still be there next time you visit us. French Beans, the dwarf types, grow extremely well in raised beds and containers, far better than they do in open ground. The reasons are simple. French Beans prefer a light, open and well dug soil with lots of warmth. The soil in a raise bed or container fits these conditions far better than the open ground. The soil itself is ideal and being raised it retains heat very well. The soil requirements for French Beans in a container and raised bed is a light soil which retains moisture. This is similar to many other vegetables and we describe how to set up your raised bed with soil here. For containers and raised beds, the seed sowing dates are exactly the same as for sowing and transplanting French Beans in open ground. Start sowing seed in pots indoors during the fourth week of April. Start sowing French Bean seeds directly in the ground during the second week of May. See our main French Bean article here for more details on how and when to sow French Beans. The first consideration is frost. 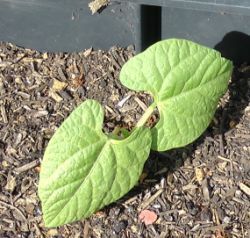 If your French Beans are threatened by a late frost cover them with horticultural fleece or even newspaper over night. This is easy with raised beds and containers, simply place wooden supports at the edges of the container and drape the protection over them. Water is the main requirement of French Beans especially in a raised bed, growing bag or container. Don't let the compost dry out and water frequently as explained here. 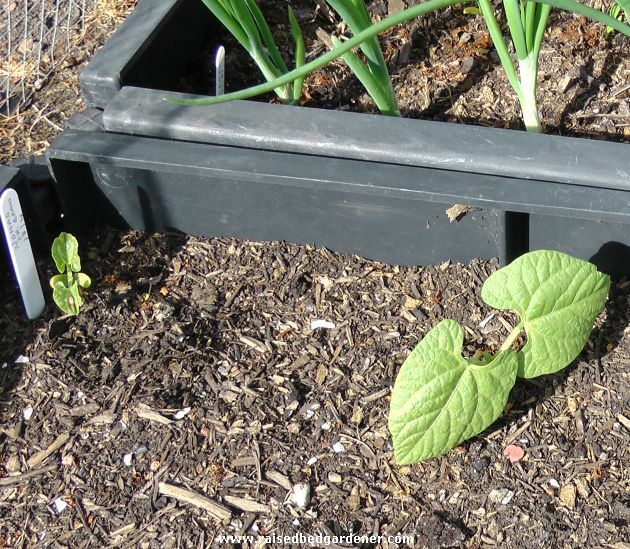 Feeding for French Beans in containers and raised beds starts with a combination of a long lasting feed, such as fish, blood and bone in late February and again in mid July. An additional feed of general purpose liquid feed each week from late March to mid September. Our page on feeding plants in raised beds and containers goes into much more detail and can be found here. Pests are few as far as French Beans are concerned. Birds do sometimes peck out the very young seedlings and because the soil in a raised bed is loose, the birds can easily remove the whole seedling. If this is a problem in your area then cover the raised bed with horticultural fleece until the plants are 10cm / 4in high. For more details on pests and diseases of French beans, click here. Slugs may also be a problem when the seedlings first emerge and the weather conditions are damp. With a raised bed it's easiest to cover the new seedlings with horticultural fleece for a week or two until they get tall enough to be of no interest to the slugs. Dwarf French Beans will support themselves in many conditions but some support will minimise damage from winds and help to support the pods off the ground. Twigs about 45cm / 18in high are ideal for light support. The plants will simply grow into and around the supports. This is especially important when growing French Beans in containers and raised beds because the soil is likely to more light and open and therefore not as capable of supporting the plants as compared to growing them in more solid open ground. Always choose dwarf varieties, not the climbing varieties. Aside from that, the particular variety is a matter of choice. Last year we choose Nomad, a variety which reaches about 45cm / 18in high and produces a good crop of tasty French Beans, they also have good disease resistance. The variety Tendergreen is another of our favourites which is very dwarfing and ideal for raised beds and containers. See our in depth review of this variety here. There are however lots of excellent varieties available. some with purple pods such as Purple Teepee. The colour is something of a novelty however because the pods colour to green when they are cooked.